Rosa Puga, a parishioner of Resurrection of Our Lord in Laurel was impressed that Archbishop William E. Lori celebrated the closing Mass at the Archdiocesan Encuentro completely in Spanish Aug. 19 at Loyola University of Maryland’s Reitz Arena. After years of preparation, 20 Baltimore parishes with significant Hispanic populations selected eight representatives to attend the V National Encuentro of Hispanic/Latino Ministry in September 2018 in Texas, the fifth gathering of its kind since the first was held in 1972. 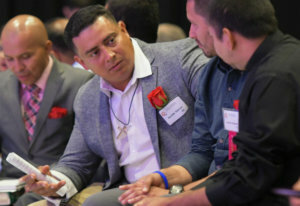 The Office of Hispanic Ministry, organizer of the Archdiocesan Encuentro, offered three morning break-out sessions for Hispanic ministry leaders only. During these sessions, the parish teams developed a working document that will lead their efforts in ministering to the Hispanic Catholic population in the Baltimore archdiocese. 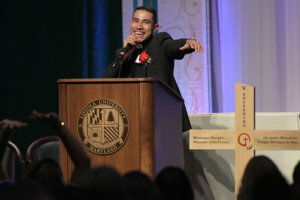 Héctor Sibrián, a Hispanic ministry leader in St. Mary Parish, Annapolis, and its mission of St. John Neumann and one of the parish delegates who will attend the V National Encuentro, said he has seen a significant increase in Mass attendance after the parish-level meetings for Encuentro this year, driven mostly by Latino young married couples and youths. With almost a decade of experience in family ministry and catechesis, Sibrián’s goal is clear. “Our team will focus on creating a pastoral team of professional lay people and clergy with a comprehensive knowledge of the Bible, who will attend to the [spiritual] needs of young people and young married couples in our parish,” he said. During the Mass celebrated by Archbishop Lori, Sibrián and seven other parish delegates to the V National Encuentro received a special blessing and a standing ovation from the 1,300 who attended this archdiocesan event. Bishop Mark E. Brennan, homilist for the Mass, referred to the delegates and said, “You are loved profoundly.” Then, he asked all the attendees to pray for them by name so that they can be effective missionary disciples of the Archdiocese of Baltimore. Email Alexandra Danter at adanter@CatholicReview.org. Alexandra Danter is the former social media coordinator for the Catholic Review and the Archdiocese of Baltimore. 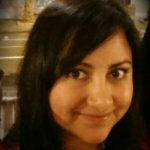 Alex has a BS in Mass Communication – Public Relations and Advertising from Towson University and a BS in Mass Communication – Journalism from the Pontificia Universidad Católica in her native Ecuador.